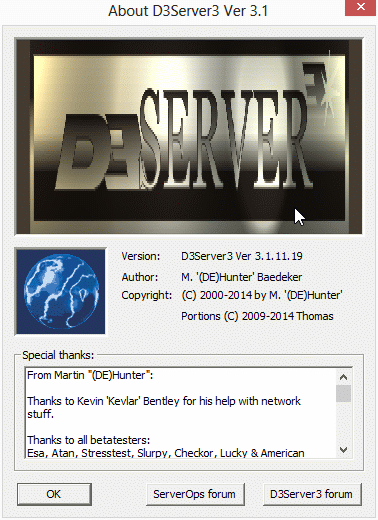 Support forum for the Descent 3 dedicated server tool D3Server3 for Windows (www.dateiliste.com/descent-3/58-descent-...t-3-server-tool.html). The Descent 3 Server Operator Board is at Descentforum.net (www.descentforum.net/ServerOps). There's also a board to discuss the software's source code. D3Server3's icon has probably not changed within a very long time. I'm looking for new icons for the software, and maybe for some other images too. For example the image shown in D3Server3's About dialog window could benefit from some improvements. If anyone got any idea or maybe already has got images I could squeeze into the software, please don't hesitate to shove them my way. There's some space in the top left corner that currently contains the PXO information. PXO has been down and most likely will never come back. Maybe this space calls for a nice image, too. Last Edit: 2014-02-08 08:35 By Thomas. "D3Server3" image is of weak colors. I didn't create that image. It came with the original package when I took it on. I reckon that Martin created it himself by using StarOffice or some similar suite. I'm not saying the picture's design is not nice but I somehow think it's not up to today's graphics standards. If someone could create a nicer one this would be highly appreciated. Maybe it can give you some inspiration. Last Edit: 2014-03-08 15:00 By Thomas. This shiny attractive image keeps some information in it, like : come, take, this product is very important to you. While it is not so. That is how advertisement often works. People buys some product, which is packed very nice. The product itself might be nothing important, but its package and cost advertises that it is. The result is : people buys that product, because it is "obviously" good, then tries it, then goes upset, because he understands that the thing he has bought ... ok, lets say it does what was written, but it has no such importantness that the people has imagined to himself. More attractive advertisement is - more soon people will take it. And more soon will find out that they don't need it so much, and that they were cheaten with advertisement. Same you may see on the style of DXX-Rebirth site : the product is good, yes (or relatively good ), but the brightness of style makes at once me think that someone is trying to cheat me and force me to take a low quality product. I was hoping to get a new icon (en.wikipedia.org/wiki/ICO_%28file_format%29) for the software. It would also be nice to get some more images, for example for the About dialog and/or for www.dateiliste.com/descent-3/58-descent-...tool-for-windws.html . 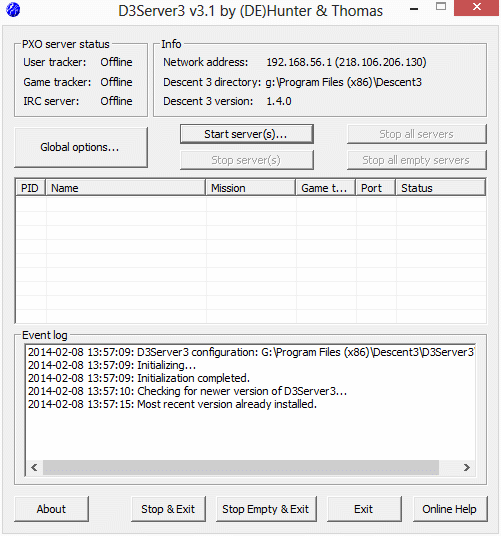 No one (well, at least I hope so ) is going to sell or trying to sell D3Server3. The software is absolutely useless for someone who's got no intention to host dedicated Descent 3 servers. That was an abstract, parallel example. Shortly saying, I meant that the picture has too bright content. A tool shouldn't have such. But that is just IMO. "Too bright" usually means it should be darker. Do you mean the application icon or the images used? You could have a look at the latest beta version (www.dateiliste.com/d3files/tools/D3Serve...3_3.1.11.34_Inst.exe) because it's got many more images than the latest release. And don't tell me we can't be sure that it doesn't contain malware.